This post brought to you by Duck® Brand. All opinions are 100% mine. 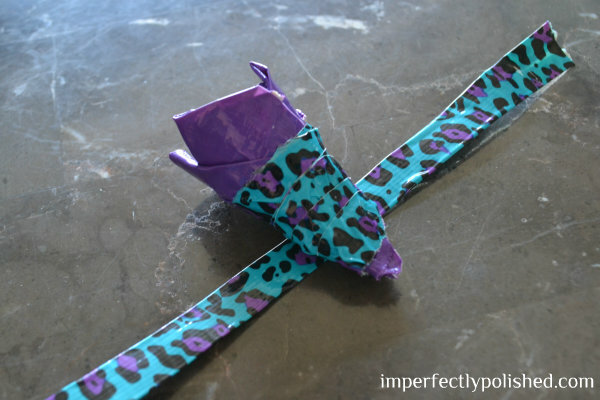 I was recently sent a box of Duck Tape® to create some crafts with for the spring. 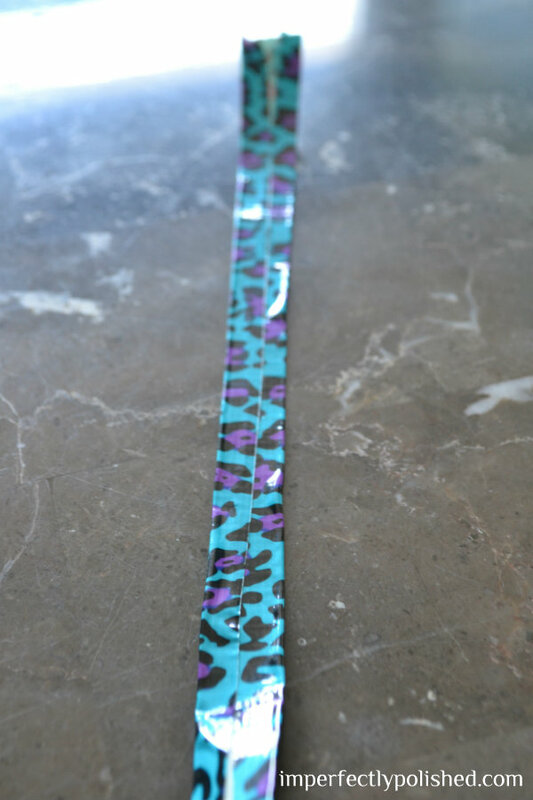 With prom season coming up, I created a couple items that would be fun for any prom-goer:) I used two different tapes: one leopard print and one solid purple print to make a fun fedora hat and matching corsage. Who wouldn't want to walk in with some fun matching accessories to prom? Let's start with the hat how-to. 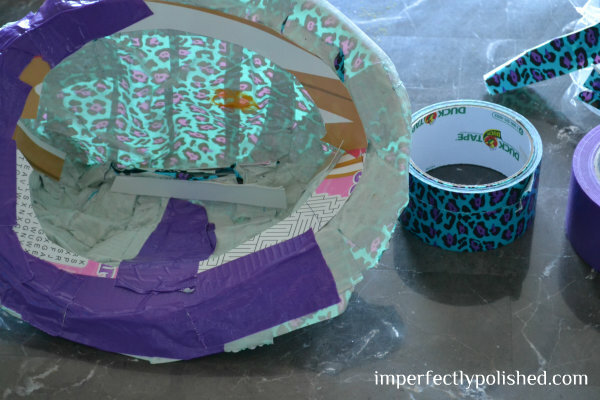 You'll need two different types of Duck Tape®, a hat to copy, and some cardboard. I used the fedora as my mold. I took the leopard print tape and ripped strips to cover the hat. I went vertically around the hat part first. Then I started on the rim. FInally, I added a strip of tape over the center top of the hat. Once I had all of that taped, I took the tape hat off the real hat and started on the inside. I cut some cardboard to give the hat some shape. I traced the fedora for the circle edge and then also put a couple pieces from the edge to the center. Finally, I added a cardboard piece to each side of the center dipped area to keep the shape there. 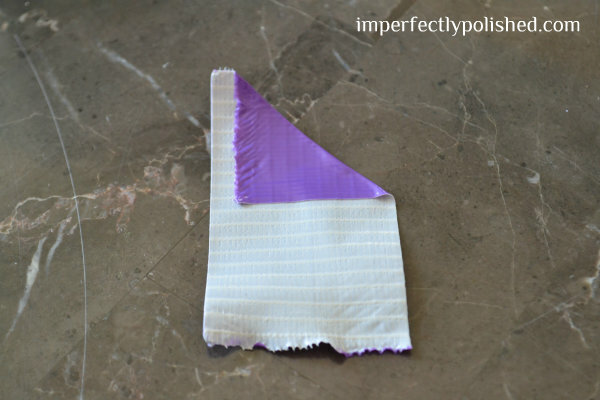 The last part of the hat was to add the purple stripe. 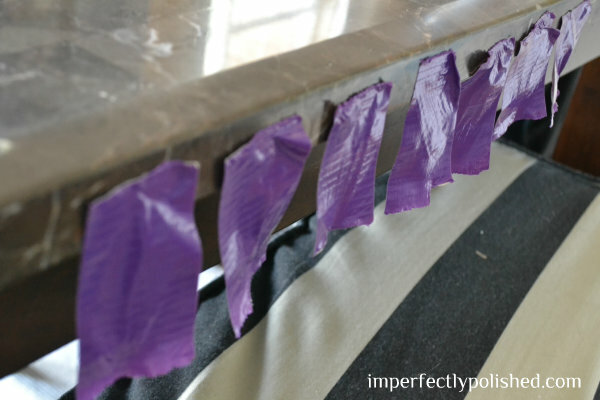 I ripped a long strip of purple tape and folded each edge in so the sides were nice and finished. I left the center of the tape fold open so that the stripe would stick to the hat. Then I made a matching flower corsage. 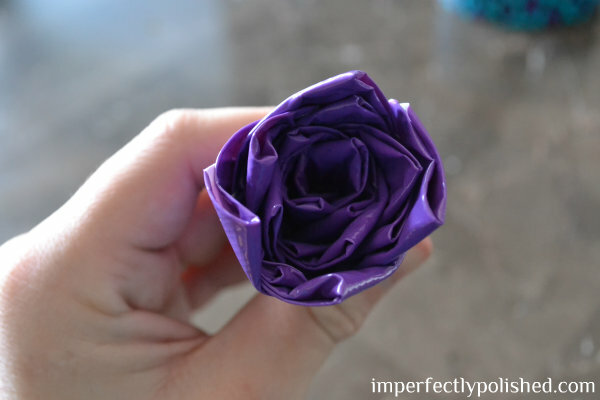 There are a ton of tutorials out there on Duck Tape® flowers. I just searched around, read a few, and then started crafting my own. 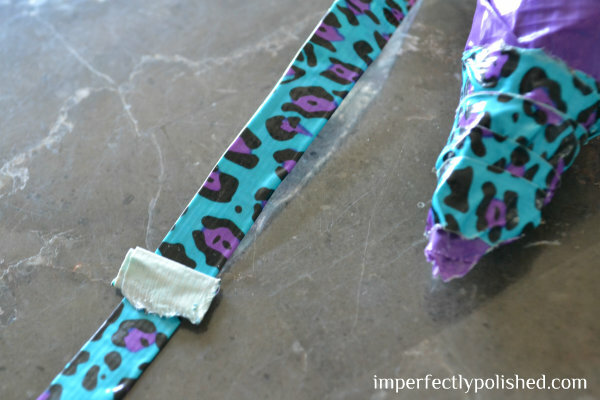 You will start by ripping a bunch of strips of tape. They don't all need to be the exact same size, but they do all need to be rectangles. Mine were probably between 2-3 inches each. Lay out one rectangle first. 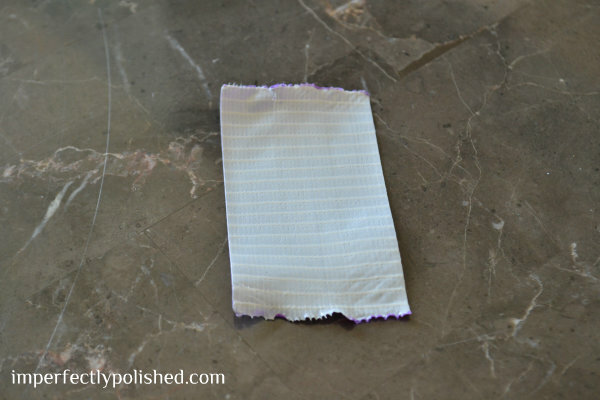 Then fold one corner down. 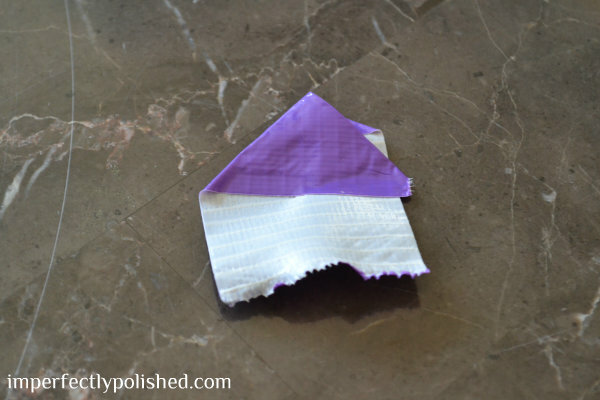 You'll want to make sure you leave some sticky edge on the side and bottom. Then you'll fold down the other side. It doesn't have to match up perfectly to the edge, but you'll want to have the point at the top. Then roll up the bottom part and this will be your center part of the flower. 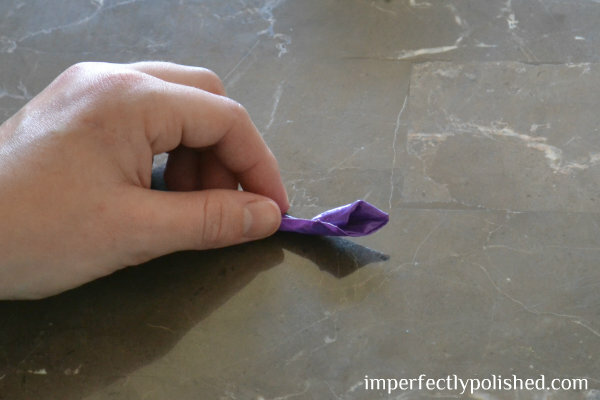 Continue making these "petals" and wrap them around each other. Once you have a flower that is the size you want, you'll need a band to wrap it around your wrist. 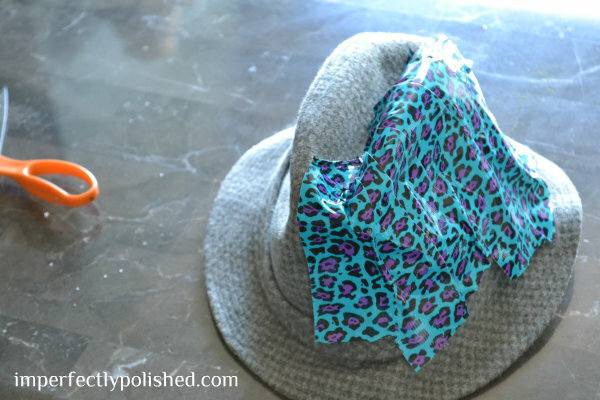 I took the coordinating leopard print and made a strap, similar to the stripe on the hat. I didn't leave a sticky center this time. 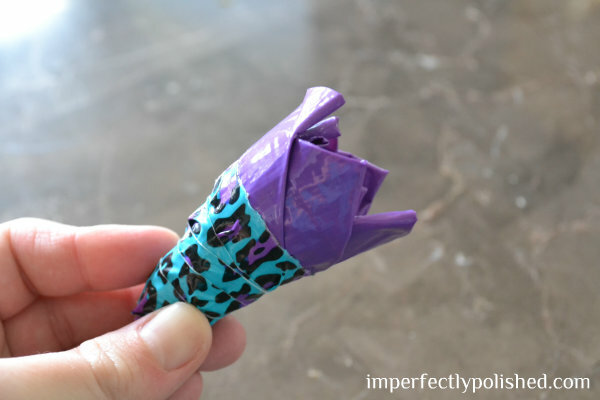 I also wrapped the bottom edge of the flower with the leopard tape. 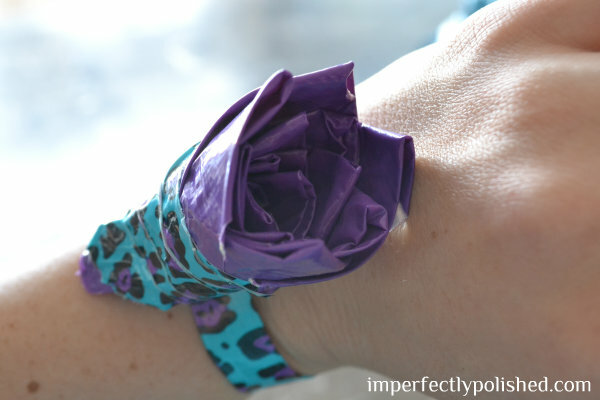 Tape the flower to the band and you're ready to go! It took less than an hour to make both of these so any one with a little extra time could do them. I think they would be so much fun for a prom couple! 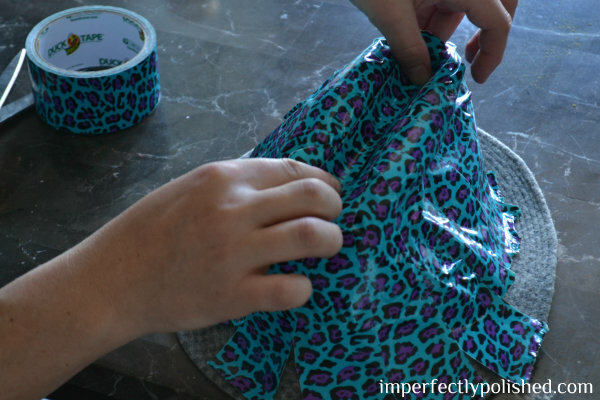 Become a fan of Duck Tape on Facebook for more inspiring ideas! Duck Tape® is also running a Scholarship contest right now through June 10th called Stuck at Prom®! To enter you'll need to create your own prom-inspired Duck Tape® craft and submit your project here. You can find more details here and all the FAQs here. I'd love to see if you enter a project! « The Bathroom is Painted!